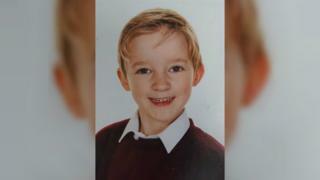 Image caption Riley Jake Jackson died in hospital from "fire-related burns and carbon monoxide toxicity"
The death of a six-year-old boy in a house fire in Derbyshire has raised questions about the continued use of halogen bulbs in homes. Riley Jake Jackson died in hospital from "fire-related burns and carbon monoxide toxicity" after being rescued from a house in Ilkeston in October. An inquest at Derby Coroner's Court heard the fire started when the heat from a halogen bulb set a lamp shade alight. So how safe are halogen bulbs and why have they been banned? How dangerous are halogen bulbs? Coroner Robert Hunter recorded a conclusion of accidental death but expressed concerns halogen bulbs were still widely available to buy. Halogen bulbs are seen as a bigger safety risk than modern LED bulbs as they reach higher temperatures, creating a fire risk if they come into contact with flammable materials. In Riley's case, the inquest was told his bedside lamp had fallen over and the heat from the bulb had caused the lamp shade to set alight. Halogen bulbs were banned from sale across the European Union in September on environmental grounds, rather than safety grounds, as they are seen as less energy efficient than other types of bulbs like LEDs. However, retailers are allowed to sell remaining stocks and there are no restrictions on them being used. How can parents keep their children safe? Child Safety Europe recommends parents opt for LED lamps, which do not produce as much heat as halogen bulbs. They said lamps should be placed a safe distance from pillows and duvets to avoid being knocked over and children should be discouraged from pulling them under the covers to create a "cosy tent feeling". Should we throw away our halogen bulbs? Prevention area manager Rob Taylor, from Derbyshire Fire and Rescue Service, said the fire which caused Riley's death was "devastating". He said following the inquest, "our aim now is to raise awareness regarding the temperatures that halogen bulbs burn and ensure people are aware of the potential fire hazard lamps with halogen bulbs pose if they fall over and come into contact with combustible materials". How can I tell if my bulbs are halogen? The best place to check is the box but failing that, halogen bulbs are distinguished by their bulb-within-a-bulb appearance. At the inquest, Dr Hunter told the court he would be writing to the government about the issue of halogen bulbs still being available to buy. A spokeswoman for the Department for Business, Energy and Industrial Strategy said: "The government's top priority is to protect consumers from harmful products. The EU ban on halogen bulbs was brought in for energy efficiency reasons rather than because of any safety issue. "Regardless, halogen light bulbs are covered by existing UK regulations that require them to be safe when sold." Which household items should make a comeback?